This link takes you to the telescope in question, given that it doesn't have a particularly memorable name: Click here. The smaller images in this review can be clicked on to open larger versions. Do you ever feel that you’ve got too much stuff lying around? Even I feel that way sometimes. Towards the back end of 2010 I began to have those sorts of thoughts about my telescope collection. It’s good to have a selection of ‘scopes, but when there are two or more fulfilling the same role in a collection, then it’s maybe time to have a think. I was concerned that my 127mm f11.81 Skywatcher Maksutov and Celestron C80 ED Apo were too close to each other. Both were being used as small portable ‘scopes for “quick looks” and travelling with. Both had the same mounting options. 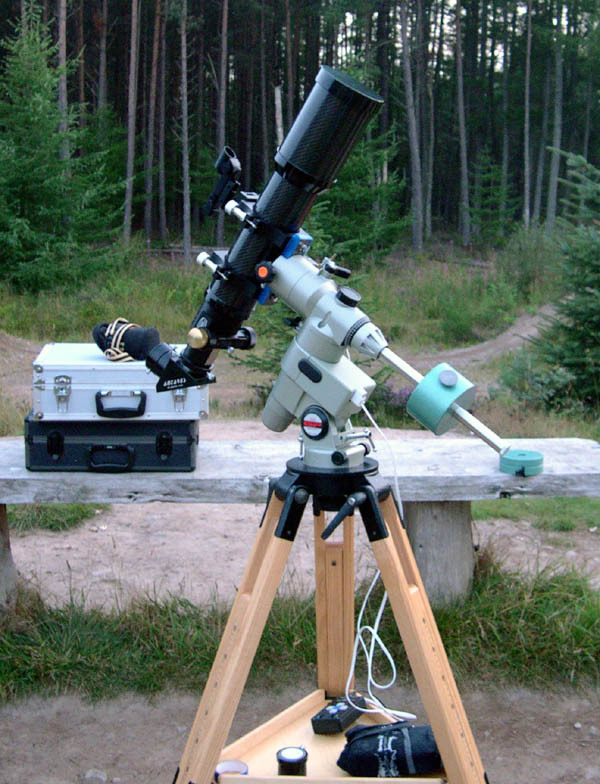 The difference in aperture was not great, especially when you consider the central obstruction on a Maksutov and compare that with the high quality optics in an unobstructed Apo refractor. So, I thought: why not consolidate the collection a bit? Move the 127 Mak and 80mm ED on and replace them with something that will have the best qualities of both yet still be portable and easy to use. I began to look around and discuss on the astronomy forums. I knew I wanted another refractor with an aperture somewhere between the 80mm and 127mm ‘scopes I was letting go. I wanted quality optics with the ability to yield high power planetary views as well as nice wide field vistas. I wanted a ‘scope that made its presence felt and would last a while in my collection too though. It would be nice to actually want to hang onto it for a while, so a ‘scope with “character”? Was this too much to ask for? As it turned out, not at all. The obvious choices are the William Optics 88mm and 90mm Megrez models, the William Optics FLT98, the various incarnations of 102mm f7 ED doublets (including William Optics 102mm Megrez) and a rather nice unsung hero ‘scope: the Revelation 100mm f6 ED doublet (available from Telescope House for a very reasonable price). All of those ‘scopes have their merits: excellent colour correction, reasonable aperture, good build quality, etc, but they are what everyone would consider when presented with this selection. They are the “usual suspects”. A discussion with a member of the Stargazers Lounge forum offered up another choice. 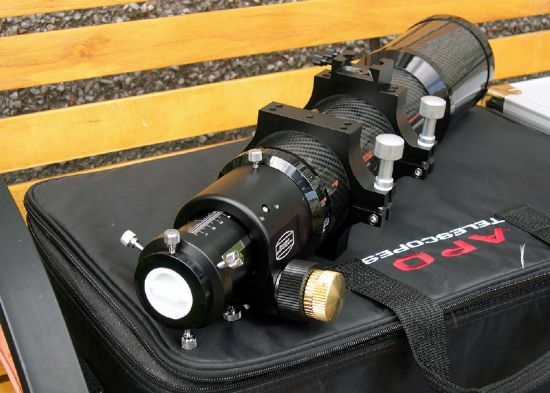 Telescope Service have been producing their own telescopes for a while now, and they recently branched out into the triplet Apo scene. They use Chinese-sourced triplet lens configurations, in very reliable lens cells, fitted in nicely built tube assemblies and equipped with a selection of nice focuser models. The SGL member had the 80mm f6 model and was amazed at the optical quality. I rattled off an enquiry to my friends at TS in Germany and waited to see what they’d suggest. They got back to me the next morning with their suggestion: The TLAPO906T. 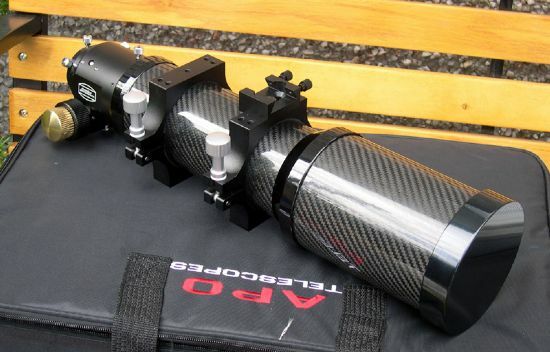 90mm aperture, 600mm focal length, ED triplet configuration using one element of FPL-53 ED glass, mounted in a carbon-fibre tube! The package would come supplied with CNC tube rings, dovetail bar, case and a choice of generic, Moonlite or Baader Steeltrack Crayford dual-speed focusers. Price was discussed, and being a long-time loyal TS customer I was offered the package at a slightly discounted price that was at the limit of my “budget” (such as it was!) and so it was ordered. It arrived promptly and I was instantly impressed by the build quality. The 'scope feels very robust and well put together. The coatings on the lenses are a deep rich green colour and they do an excellent job of removing reflections, so that sometimes you get the impression there’s no glass there at all if you look at it in just the right way. The tube has baffles within to eliminate reflection from interior surfaces, and a sliding dew-shield. The dew-shield only slides out a few inches, but the lens cell itself is slightly recessed so the actual distance from the front of the cell to the end of the dew-shield is only 55mm. Personally, when I saw this, I wondered if it would be enough to prevent dewing. More on that later. The focuser is a Baader Steeltrack dual-speed Crayford. Very robust with a flat steel plate running along the underside of the drawtube, against which the focuser shaft bearing turns, which moves the drawtube in and out. There are the usual tension adjusters and locks, and the focuser has a 360-degree rotation feature with a locking knob on top to hold it in position once it’s at its desired position. 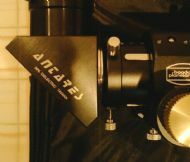 Out of the box, the focuser was almost perfectly adjusted. Nice and smooth, not too much tension and not too sloppy. It’s a curious thing; different from my Moonlite focusers with a more “organic” feel to it, but it works well despite an odd idiosyncrasy that Baader have built into it. The portion into which the diagonal fits is not quite deep enough for the nosepiece of my 2” diagonals to fit completely in. There is a ridge within the drawtube at just such a distance that the nosepiece rests against it with 3-4mm showing outside of the focuser. The three screws that tighten the compression ring hold the diagonal firmly in place but it looks a little odd seeing that 3-4mm of shiny chrome barrel between the shoulder of the diagonal housing and the back of the drawtube visual back. I contacted TS about it and they confirmed that it is completely normal for that model of focuser, but they too didn’t understand why Baader make them this way. The Baader Steeltrack dual-speed Crayford Focuser... But why does it do this? The carbon fibre tube is very stylish. Naturally, whether you like it or not is a matter of personal preference. The practical advantages of it are a reduction in overall weight and supposedly faster cooling. A triplet telescope will weigh more than a doublet and will take longer to cool to ambient temperature, so anything that can help in these regards is a bonus. Why a triplet? Doublet objectives have two glass elements. Triplets have three, usually separated by air or oil. The TS model is air-spaced. The advantage of a third lens in the optical system is that better colour correction can be achieved, as well as better control over other optical aberrations. They are particularly prized by astrophotographers because of their flat fields of view, and by visual observers for their supreme optical quality. Why isn’t every Apo refractor a triplet? Cost mostly, but they can also take a little longer to cool down to ambient temperature and are a little heavier than doublets of the same aperture. There’s 50% more glass for a start. I made several observations with the ‘scope before writing anything down about it. I was so impressed with the physical appearance and quality of the ‘scope that I did not want my objectivity clouded when reporting on its actual optical performance. For this reason, I don’t actually have my observations split into “first light”, “second light” etc for this review. My observations all took place over a long period of time – months in fact – from different locations, but I will list everything I noted about the ‘scope’s optical and mechanical performance – the good, the bad and the ugly. One of my first observations was of a Jovian transit. It was the best view of such an event I've ever had in any telescope, although admittedly I've only seen a few. The seeing contributed of course, but the shadow of the moon (Ganymede) was pin sharp and jet-black. The disc detail was stunning that night and it honestly felt like I was looking through a telescope larger than 90mm – my old 100mm Skywatcher ED perhaps in terms of detail. This observation was made at a time when Jupiter was still high in the sky and the level of disc detail that was shown really did amaze me. I wasn’t prepared for the planetary detail that the ‘scope would show me. I was impressed by the Jovian performance, but I also wanted to assess it on Deep Sky Objects too. Views of various DSOs have shown that generally, it performs like many other small aperture APOs. The Double Cluster, Ring nebula, Dumbbell nebula, Coathanger asterism, M31 group, M33, M45, etc - all the usual small-‘scope targets if you like, show the sort of view you'd expect from a good quality 80mm to 90mm ED scope. With one caveat - the field of view is flatter than I've noticed before. Even with my 22mm LVW, an eyepiece that has a famously flat field, the view noticeably FLATTER than when I've used it in my previous small ED scopes. The view through my 13mm Nagler was even more noticeably flat, with only the very extreme edge suffering from any distortion at all. There is NO false colour. Either in focus, inside focus, or outside focus, there is none that I can detect. Also, the diffraction rings are perfectly round, smooth and concentric. This is one of the main advantages of an ED triplet but they don’t all pull it off successfully. This telescope certainly does. Star colour is vibrant and natural to my eyes, as was colour definition on the disc of Jupiter. Many shades and tones were visible in the Gas Giant’s atmosphere. This scope seems to have unchained the true optical excellence of my eyepiece collection. Not that my previous ED80 was a slouch - but the Triplet gives that little bit more performance from them. In terms of "feel" (very subjective I know) it's like using my old TeleVue 85 rather than my more recent Skywatcher ED80. I spent a few evenings observing Comet 103P Hartley as it passed near the Double Cluster. 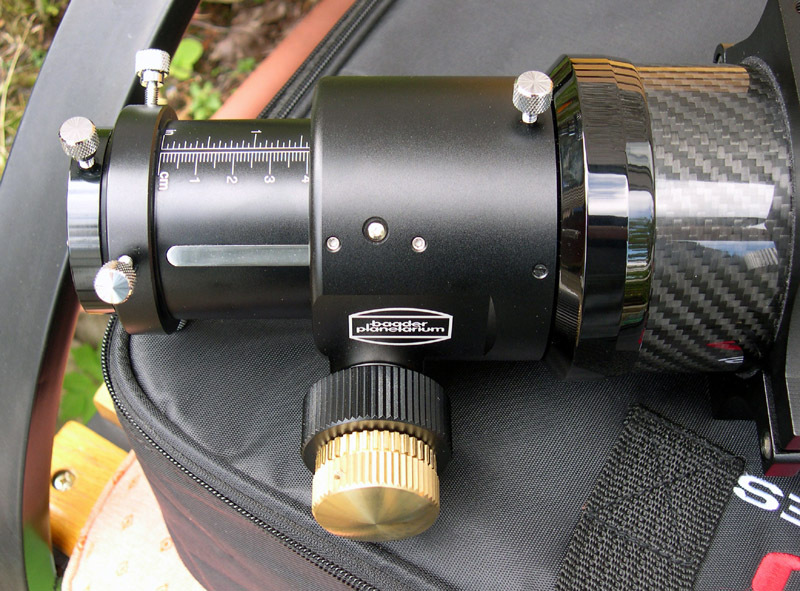 What a great time to have a new telescope – and such a fine one too! More recently (Jan 26th 2011), with Orion fairly high in the sky, I was able to study the Great Orion Nebula with the little Triplet. Using a new Celestron Axiom LX 23mm 82-degree eyepiece for 26x and a 3.15 degree field of view, two things instantly struck me: I could see colour in the nebula and the four main trapezium stars were split! I was amazed that I could actually detect a hint of green in the nebula itself. Further surprises awaited me. While viewing the Trapezium, I used a cheap 6mm Orthoscopic eyepiece to zoom in for 100x on the main trapezium stars. The E star was readily apparent and the F star came and went, though as viewing continued it tended to stay more and go less. I considered that, through a 90mm scope (albeit a triplet Apo) with a cheapo 6mm Ortho at only 100x, to be pretty impressive! On that same night, NGC 2024, the Flame Nebula, was easily visible. It sits very close to the belt star Alnitak and can be quite a challenging object. A dark sky and good optics are required for it. Luckily I had both! Lunar viewing has been rewarding so far, though I’ve only had limited opportunities to do little more than some lunar sightseeing. The ‘scope takes high magnification well allowing for very satisfying cruises along the lunar terminator on an alt-azimuth mount. Contrast is excellent and the total lack of false colour makes for a very immersive lunar viewing experience. I look forward to exploring the Hadley Rilles using the Triplet on a driven mount. 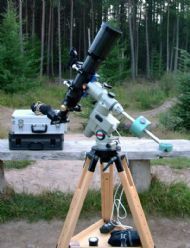 At one of the club’s public events at the JSL Observatory at Culloden, I had the ED Triplet set up with my Baader Herschel Wedge and Pentax XF zoom eyepiece. 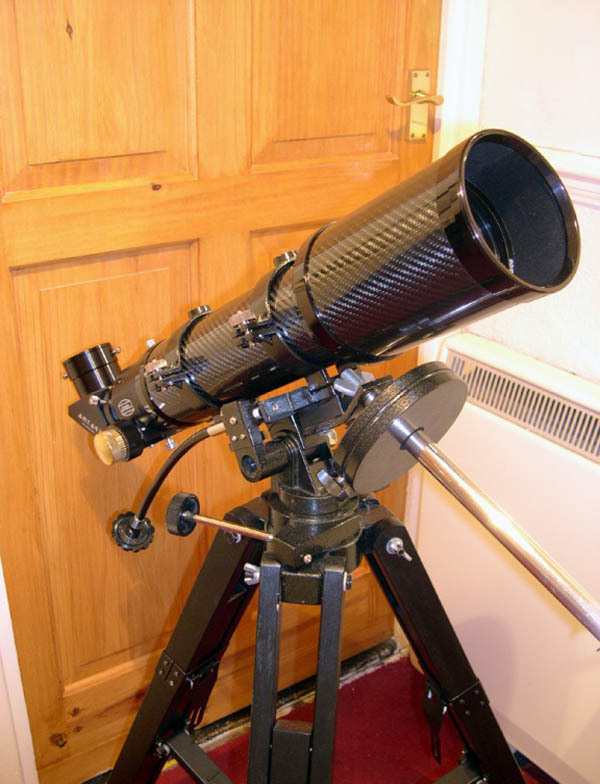 I had turned my back to speak to someone for a moment, and the next thing I knew was one of my fellow club members (Pat Escott) handing me what looked like my focuser, wedge and eyepiece, all joined together, but definitely not joined to the telescope! In fact that’s exactly what it was. A child had “done something” to my ‘scope while it was unattended and only Pat’s presence of mind and quickness of action prevent the whole assembly from crashing to the ground! Upon examination, it was revealed that the Baader Steeltrack focuser is held on by three round-tipped screws, which settle against a lip and hold the focuser body in place while allowing it to rotate. It seems these screws had worked loose, so that when the rotation position locking knob was loosened, the whole back end of the telescope succumbed to gravity and fell out. I reattached the focuser and tightened up the screws again. Personally I’m not a huge fan of rotating focusers. They have their uses but the only one I feel completely comfortable with is the Moonlite on my Equinox 120ED. I now regularly recheck the tension on the Triplet’s focuser screws and periodically give them a little tweak. My suspicion that the dew-shield was not long enough may have been correct. At some point during my use of the telescope the lens was exposed to some kind of airborne contaminant. It appeared as tiny bright spots against the lens coating, which were not removable by use of an air blower or a fine brush. I was reluctant to give the lens a full clean so I contacted TS again and they agreed to examine the lens and see if they could identify the problem. After they’d had it a couple of days I got an email to say that they thought it was organic matter and that they had given it a thorough clean and were returning it to me. No charge. Their opinion was that someone had sneezed on or near to it! Since then I’ve always used an additional flexible dew-shield over the top of the built-in sliding one and the lens is still in the pristine condition it was in when it was returned to me. The supplied case. The foam in it is soft, squishy and difficult to cut to shape, which is a shame as the pre-cut hole for the ‘scope is nothing like the right shape. Also there’s no padding on the inside of the top flap, so one or other of the focus knobs could be impacted if the case is knocked. In the end I bought a Skywatcher ED80 aluminium case for the ‘scope. The interior foam needed some slight trimming, but the whole thing is much more sturdy and the ‘scope is now really safe inside it. The extra cost was about £60 but I felt it was worth the investment for peace of mind. Finally (and I’m really clutching at straws here) the finish of the tube is slightly odd if you’re used to painted tubes. The finish does repel fingerprints quite well, but it’s an odd sort of satin-look that doesn’t polish particularly well and always looks like it needs a bit of a buff. Still, that’s the nature of the material used and the manufacturing process I suppose. It certainly still looks pretty classy in the daylight! The individual elements of this telescope are in themselves all very good: Fantastic optic. Top quality CF tube assembly. Top notch focuser. Well made accessories and fittings. But the whole seems to be even more than a sum of its parts. Using this ‘scope on my super-modified AZ3 mount as the "ultimate grab'n'go" setup is a sublime experience, whether it be touring open clusters at low power or examining lunar features with high power orthoscopic eyepieces. It has definitely ended up fulfilling the needs I had of it. 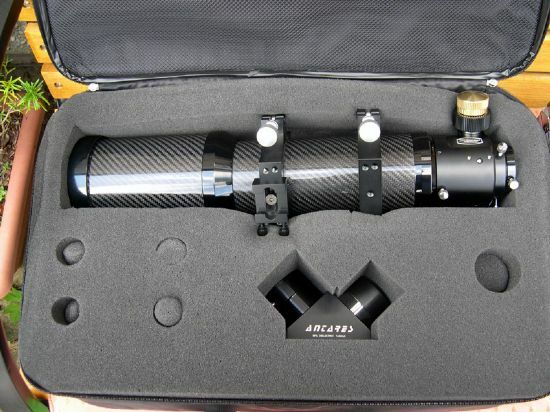 It has the high magnification capability of the 127mm Maksutov it replaced, along with the portability and wide-field ability of the C80 ED refractor. I sold two telescopes of similar size and quality to each other (both excellent in their own right) and replaced them with something a little bit special.